Firing clay in an electric kiln is the most common firing method because electric kilns are readily available and relatively inexpensive. A search for “kiln” on sites like Craigslist typically yields multiple results. Often times, buyers of these kilns are given very little information on how the kiln works or how to fire it. Buyers may have just caught the ceramic bug and may have never heard of kiln wash or fully understand pyrometric cones. Without the proper guidance, firing pottery at home can have disastrous results! So in this post, I thought we’d share some great tips for firing clay in an electric kiln. In this excerpt from Electric Studio: Making and Firing, David Gamble shares ten tips for successful electric kiln firing. –Jennifer Poellot Harnetty, editor. I conduct a lot of workshops for K–12 teachers around the country every year and I’m thrilled about the enthusiasm educators have for teaching ceramics to kids. Throughout these workshops I answer many questions and hear a lot of stories on the subject of firing, especially of electric kilns. There are two main reasons for firing clay, and in most cases two different firings are required. One is to prepare pieces for glazing by firing what is called a bisque. 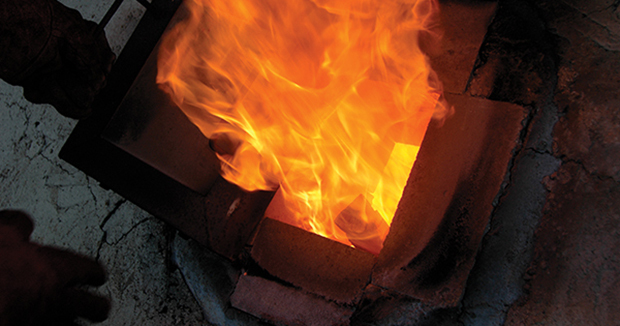 In this firing, the heat from the kiln changes the molecular structure of the clay and hardens it so it will no longer break down in water to its original moist, pliable form. This also makes pieces less fragile, but still porous enough to absorb water so that when wet glaze is applied, it will stick to the surface. The second firing is to melt and fuse any applied glaze to the surface and for higher temperature firings, this firing further strengthens the pots. Expand the potential of your electric kiln! More and more, the electric kiln is being used not just as a means to fire work, but as a creative tool. Our handbook Electric Studio: Making & Firing, is designed to help you maximize the potential of your electric kiln and use it as an integral part of your creative process. You’ll discover how to select the kiln that’s right for you, learn how to maintain it and make simple repairs, and best of all explore various firing techniques to achieve spectacular results once reserved only for large fuel-burning kilns! 1.Before you fire. When installing your kiln, make sure it’s at least 18 inches away from any wall. Vacuum the interior of the kiln, especially the element grooves (figure 1), about every 20 firings, and after every firing when a piece blows up in the kiln. Inspect hinges and handles for wear (figure 2). Check the thermocouple(s), and replace if necessary (figure 3). Every six months, unplug the kiln (if your kiln has a plug) and inspect the prongs as well as the insulation (figure 4). Brown or black discoloration indicates a worn plug or loose wires and a potential fire hazard. Keep all flammable, combustible and meltable materials (cardboard, wareboards, newspaper, fabric, vacuum hoses, plastic, etc., away from the sides and top of the kiln. These areas get extremely hot. 2. Protect your shelves. Kiln wash protects your shelves from glaze drips. Inspect shelves prior to firing and recoat any bare spots or recently cleaned and scraped shelves as needed (figure 5). Remove any loose or chipped kiln wash that make flake onto pots during the firing. Store unused shelves in a safe and low-traffic area. 3. Always use cones. Pyrometric cones are formulated from ceramic materials including clay, oxides, feldspars, and frits, and are designed to bend at specific time/temperature combinations to give you an accurate reading on the heatwork created in your kiln. Cones measure the relationship of temperature absorbed by the ware over time. Tip: Use cones even if you are using an automatic kiln controller. Cones verify the accuracy of the controller and are a backup if the controller fails. 4. Clean up greenware. Signatures and decorations leave burrs that must be removed using a damp sponge while leather hard, or drywall sanding screen for drier work, before the bisque firing (figure 6). Once fired, the only way to remove these is by grinding with a Dremel tool, or sanding with wet/dry silicon carbide sandpaper. 5. Handle greenware with care. Bone dry greenware is fragile—more fragile than when it’s leather hard. Never pick up pieces by any appendage or handle. 6. Fire dry pots. To see if a pot is dry, touch the pot to your cheek (figure 7). If it is cold or damp, there is still moisture in it and you will need to preheat the kiln to 180°F and leave it at that temperature and vented until all moisture its gone. Water boils at 212°F (100°C), and that’s the temperature where there’s danger of blowing up pieces. If the moisture is not driven out and the temperature rises to water boiling levels, the rapid expansion of the steam that’s created blows out the walls of your piece. 7. Wipe your feet. Any glaze that touches the shelf during a firing sticks to it. Carefully sponge off any glaze within ¼ inch of the bottom of the foot. For pots with thick or runny glazes, clean off a bit higher than that. Do not rely on the kiln wash to save the pot or the shelf from being damaged by glaze drips (figure 8). 8. Loading greenware or glazeware. Electric kilns heat from the outside walls, where the elements are located, in towards the center, so stagger the shelves and place taller pots in the middle of the stack to promote better heat penetration to the middle of the kiln. Greenware pieces can touch and can be stacked in some cases, but I prefer to leave space between them for even heat distribution. When placing a large flat piece on the top shelf, allow approximately five inches of clearance to the top. Extra clearance allows for heat from the sides of the kiln to travel up and over, reaching the middle of the piece so that all areas heat evenly. If wide pieces are heated unevenly, the expansion rate of the side may be considerably different from that of the center of the piece, which will cause it to crack. In all firings, keep a the edge of the stack at least 1 inch from sides of the kiln (figure 9). 9. Bisque fire slowly. Clay contains organic material that needs time to burn out. If you raise the temperature of the kiln too fast, gases will become trapped in the clay body. Organic materials burn off between 572°F (300°C) and 1472°F (800°C). Also, if not completely burnt out in the bisque, organics may give you trouble in the glaze firing as it as escapes as gas, pushing through the glaze and creating pin holing, which can mar the glaze surface. 10. Keep records. Keep a firing record of firing times (lengths), the cones you used and the result of their melt (draw a quick sketch of how they looked, or note whether the target cone was at 1, 3 or 5 o’clock for example), and record the number of firings in a particular kiln. These records can give you indications on element wear (e.g., if firings take longer than usual) and future maintenance that may be needed. bisque, bisque fire, bisque firing, body, bone dry, ceramic, ceramic materials, ceramics, clay, clay body, combinations, creative, dry, electric kiln, element, fast, feet, feldspars, firing, firing clay, firing pottery, firing pottery at home, firing techniques, firings, foot, form, glaze, glaze firing, glazes, glazing, greenware, handle, handles, heat, heatwork, how to, information, kiln, kiln cones, kiln controller, kiln firing, kiln wash, learn, leather hard, loading, materials, pieces, pot, pots, pottery, process, pyrometric cones, questions, quick, results, runny, safe, sanding, share, shares, shelves, silicon carbide, sponge, stories, studio, surface, taller, teaching, teaching ceramics, techniques, thermocouple, time, tip, tips, tool, travel, ware, wash, water. Bruce, I am trying to do my own elements but have not been able to get specs on elements. Is it enough to use a vernier calliper to measure the diameter of the element? I have the ohms resisted cell spec for each element so is that the best spec for final element length? Thanks for any info you can share. i’ve built a few electric kilns including a 60ft tunnel for firing tiles. You can easily make your own elements and repair broken elements. To repair broken elements you need a brazing torch you use stainless steel flux and Kanthal wire. The small kilns you are using are easy to make elements for. First source the right grade Kanthal wire. Count the number of turns per inch off the element. Get some dowling or pipe the same diameter as the element. Then simply wind the wire around the pipe. For bigger elements you need a lathe and feed the wire around the pipe through the tool box. You guys need to be more self reliant and stop relying on Ceramic suppliers. Have a go.